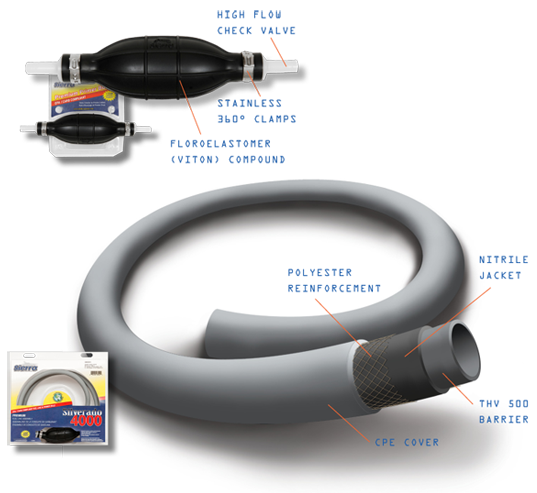 In 2011, the EPA required all primer bulbs and primer bulb assemblies to utilize low permeation components to reduce pollution causing hydrocarbon permeation through the hose and/or primer bulb by as much as 85%. In response, Sierra introduced a new EPA approved primer bulb that exceeded the mandated permeation rate while maintaining Sierra’s traditional look, feel, and operational characteristics. Manufactured from a unique FKM material, Sierra’s primer bulb meets both EPA and CARB standards while providing outstanding warm/cold weather flexibility. The Silverado 4000 is a rubber fuel line with fabric reinforcement that features a PVDF layer to prevent permeation. Designed to meet all EPA/CARB requirements and compatible with all blends of ethanol reformulated fuel, the Silverado 4000 is extremely flexible and kink resistant in all weather conditions. Utilized in the Sierra fuel line assemblies, the Silverado 4000 is also available in 5/16” and 3/8” (nom.) in 300’ bulk coils, 50’ and 25’ Shields roll out cartons, and 10’ poly bags.